2004. It was the year when millions of players assumed the role of rookie cop-turned-secret agent Leon S. Kennedy as he traveled to rural Spain in pursuit of Ashley Graham, the president's missing daughter. A watershed moment in gaming, Resident Evil 4 was a reinvention of both its series and its genre - not to mention one hell of a party. More importantly, Leon had amazing hair. Oh, and he flipped over lasers. For many, he entered the hallowed halls of video game heartthrobs in the same way he crashed through two-story windows: suddenly and with swag. But we all know Leon's story. What about Ashley's? 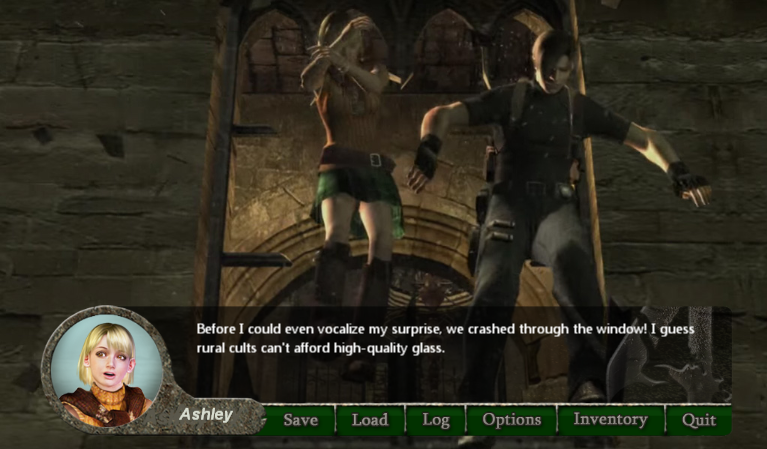 For the players of Resident Evil 4, she is, at best, an objective; at worst, a liability. A human cog in a well-oiled gameplay machine. But what if she was more than that? What if she was an interesting person, thrust into a crazy world with crazier men who run the gamut from hottie to hellspawn? How would she narrate this nightmare and who would she actually fall for? Wonder no more. This is her story. This is RE4: Otome Edition. Relive the events of Resident Evil 4, faithfully recreated from Ashley's perspective - and with exactly as much absurdity as that entails! Discover what happened to Ashley in the scenes you never saw, such as her initial kidnapping. Make fake decisions that reveal the illusory nature of choice! 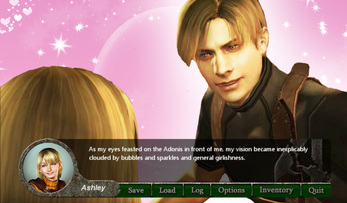 DISCLAIMER: RE4: Otome Edition is a parody and thus subject to Fair Use. We are not in any way affiliated with or endorsed by Capcom. All rights belong to their respective owners. If you haven't played Resident Evil 4 yet, you probably should. Fortunately, it's on most every major gaming platform. * You can't actually do any of this, but Ashley doesn't know that. How's the project? I just played the demo once again and I hunger for more! It's slow-going, due to unfortunate distractions like "day jobs" and "errands", but it is coming along. All of Chapter I has been imported into the new engine, and there's been a lot of new material added. We're trying to polish up Chapter I before transitioning headlong into Chapter II (which has the brunt of its content mapped out, and some of it already ready to import). We're entertaining getting a new demo out once that's done - but at the same time, the quality differential between the demo and the full game is pretty stark, so we might want to preserve some of the surprise factor and just focus on a full release later this year. In any case, I'm using what's left of my youth (which isn't much, to be fair) to burn midnight oil and get these games done, so we hope to show you something more soon! Just keep the hunger alive! 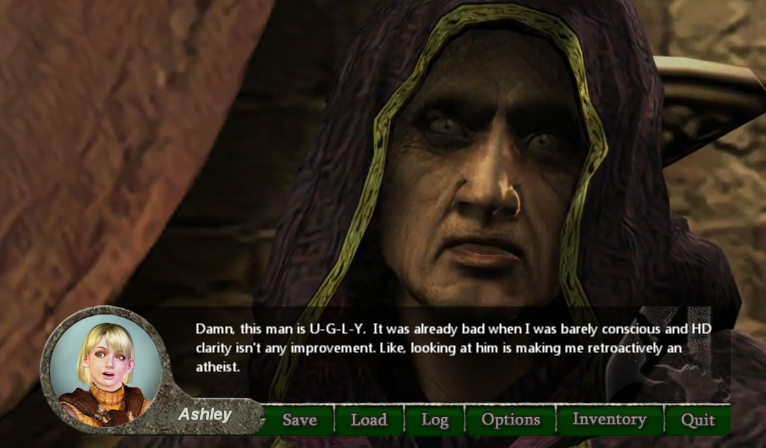 Y'know, like Ashley! Perhaps the more interesting topic is how much opportunity does Ashley actually have to see Ada? Hmmmmmmmmmm. We lay claim to nothing. Expect as little as possible, so as to maximize your satisfaction, ha. Ho oh, yes, the infamous water room. We have plans. 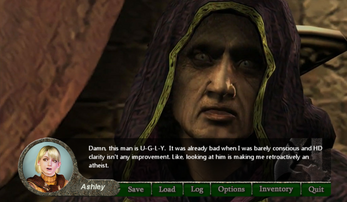 Personally, I'm looking forward to recreating Ashley's gameplay section. It's gonna be one hell of a party. Thanks for the well wishes, Derptaku! We'll certainly give the game its time in the oven (we're not planning to charge for it, so it's not like we have much to gain by rushing it out), although we'd like to get it out sooner rather than later, before we get too old for doing actual otome games, ha. Fingers crossed for a release sometime early 2019. Glad you liked it so well! We feel pretty confident in saying that the full game is a marked improvement over the demo, so we hope you'll look forward to playing it in the sometime-eventually future!